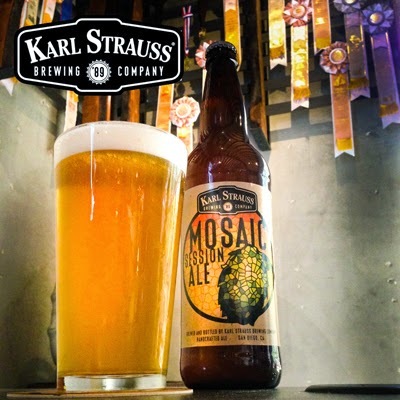 Karl Strauss Brewing Company’s pioneering new beer release, Mosaic Session Ale, is batting a thousand in beer competitions. The unique single-hop brew boldly features Mosaic hops and was born out of the company’s innovative small-batch “Tank Tap” program. The beer won a Gold medal at the California State Fair Commercial Craft Brew Competition and a Bronze at the Los Angeles International Commercial Beer Competition. "We are delighted Mosaic is being so well received in the market and in beer competitions," says Paul Segura, Brewmaster, Karl Strauss Brewing Company. In addition to beer competition medals, the company was recently honored with the Gold Medallion award for “Best Brewery” by the California Restaurant Association, San Diego Chapter. For more information about Karl Strauss’ recent wins and to learn more about its diverse spectrum of award winning beers, visit karlstrauss.com.